HawaiiCon — Hawaii Island’s first annual sci-fi, science and fantasy convention — launched its inaugural event with a bang, bringing an estimated 700 celebrity guests, comic book artists, writers, scientists and cosplayers from all over the world to the Hapuna Beach Prince Hotel over the past weekend. The event included more than 100 panel discussions on everything from women in science fiction to stories from NASA about deep space exploration to talks hosted by “Battlestar Galactica,” “Stargate Atlantis,” “Farscape” and “Babylon 5” stars. There were also workshops, meet & greet sessions, a cosplay contest and gaming tournaments. 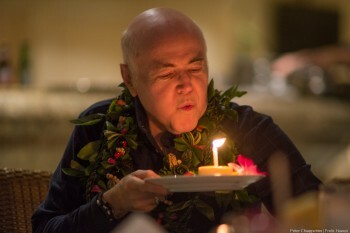 Walter Koenig, best known for his role as Ensign Pavel Chekov on the original “Star Trek,” who celebrated his 78th birthday at the Con. Torri Higginson, best known for her “Stargate Atlantis” roles of Dr. Elizabeth Weir and the leader of the Atlantis expeditions. 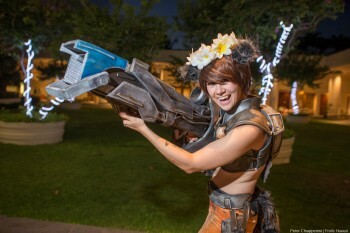 Cosplay pro and YouTube sensation Holly Conrad, aka Commander Holly. Bobak “Mohawk Guy” Ferdowsi, a systems engineer at NASA’s Jet Propulsion Laboratory and Flight Commander of the Mars Curiosity Rover. Cosplay pro and cosplay contest judge Holly Conrad, aka Commander Holly on YouTube.